All students need to prepare for the SAT. Some study for the test on their own; however, many more prepare by taking an SAT preparation course. How do you know if your child needs to participate in an SAT prep course? If he isn’t doing well in school, he definitely needs SAT prep. Also, if your child is motivated to score well on the SAT and has asked you to enroll him in a course, he will benefit from it. If he is an exceptional student, he may still want to take a course to improve his score. I had a friend who got a score of 2000 the first time she took the SAT. However, after taking a prep course she scored 2200 points on her second try. The overwhelming majority of students who take an SAT prep course receive a high score on their first test and an even better score on their second test. Besides helping your child with reviewing subject matter for the test, these courses also include test-taking strategies to help your child cope with test anxiety. Since the SAT has great influence in the college admissions process, students feel intense pressure to perform well on the test. Sometimes this pressure helps them do well. However, at other times the pressure causes them to feel so much anxiety that they become mentally impaired and even physically sick when taking the test. 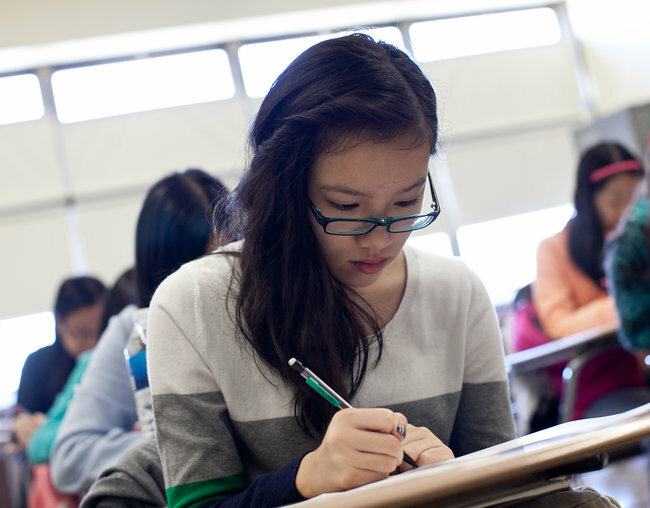 So how do you know which SAT prep course in Fountain Valley to choose for your child? What makes an SAT prep course good? Some SAT prep courses are offered online. While these may be convenient, they do not provide the same test-taking experience as in-person prep courses offer. Students often find it harder to communicate with their instructors when taking an online course. Other in-person prep courses average around 20 students per class. This also hinders students’ ability to talk to their instructors about questions they’re concerned about. Dojo Academy has two locations: one in Fountain Valley and one in Westminster, where our class sizes range from only 5 to 10 students. This allows our instructors to spend more time helping individual students. Always make sure the instructors are qualified. If they aren’t, you’re likely to see little or no improvement in your child’s SAT scores. At Dojo, all of our instructors have experience with taking the test, and have scored a perfect 800 points in the subjects they teach. Many SAT prep courses in Fountain Valley only meet for an average of 1.5 hours a day, three days a week, for six weeks. Thus, the total study time amounts to 27 hours. At Dojo Academy, we offer our SAT prep courses during the summer and on Fridays and Saturdays during the school year. In the summer, students take practice tests every Monday, and on Tuesday the instructors go over any missed problems or questions. The instructors then spend Wednesday, Thursday, and Friday covering various SAT-related subjects and test-taking strategies. Students meet for three hours a day, five days a week, for a total of eight weeks. This amounts to a total of 120 hours spent in the course. For classes held during the school year, students take practice tests on Friday after school, and then the instructors go over missed problems/questions and other SAT-related subjects for three hours on Saturday. Consider the scores of students who have attended the SAT prep courses in Fountain Valley. Although SAT prep courses can help students increase their scores, some exceptional courses help their students much more than others. Students who take prep courses with the Kaplan and Princeton Review see an average increase of about 50 points in their real SAT scores. By contrast, nine out of ten students at Dojo Academy see an average increase of 200-300 points on their real SAT scores. The prices for SAT preparation courses vary depending on how many hours you want your child to spend in the course. At Dojo, our price amounts to less than $10 per hour. In addition, we offer a 100% guarantee: If your child does not see an improvement in her score, you will receive a refund. Here at Dojo Academy, we strive to help children do the best they can in their school work and on the SAT. If you are interested in enrolling your child in one of our SAT prep courses, feel free to contact us!